Many press operations are now being fitted with automation equipment that requires limit switch outputs. While most press control outputs remain unchanged from die to die, the automation outputs frequently require adjustment. The 1980R Series Rotating Cam limit Switch with Resolver provides the safety and reliability of mechanical cams for press control circuits. The industrial grade resolver supplies the input to a programmable limit switch that provides the automation for the frequently changed outputs. 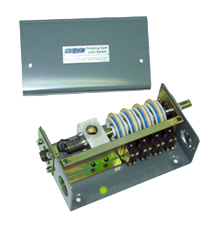 The 1980R Series Cam Limit Switch is available in NEMA 1, NEMA 4 & 5, NEMA 7, NEMA 9, and NEMA 12 enclosures, and can be ordered with 2 to 40 circuits.